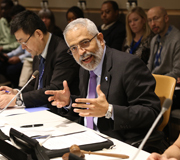 “Upon the adoption of the 2030 Agenda for Sustainable Development last September, the demand for the use of modelling tools to support national governments to adapt their national plans or policies to the sustainable development goals has increased,” said Lenni Montiel, UN DESA’s Assistant Secretary-General for Economic Development. 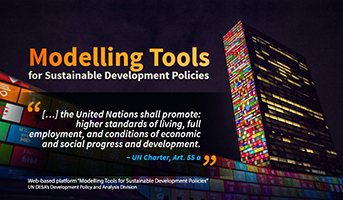 “With this in mind, we are launching today the website Modelling Tools for Sustainable Development Policies,” he said, presenting the new platform at a workshop at UN headquarters in New York. The new interactive web platform, developed by UN DESA’s Development Policy and Analysis Division (DPAD), the Division for Sustainable Development (DSD) in close collaboration with other partners and powered by the United Nations Office for Information and Communication Technologies (UNOICT), contains various tools to assist countries in the design of policies and strategies to help implement the 2030 Agenda for Sustainable Development and its 17 Sustainable Development Goals (SDGs). Featured on the new site are economy-wide models to assess the multiple economic impacts of policies and shocks; models that trace the effects of policies on social inclusion and poverty; that show the relation between water, energy, land-use and climate; how water use should be considered up-front when designing energy policies; and that simulates universal access to electricity by 2030 with the least cost technology option in 44 African countries. The intention with the platform and the different models it will be featuring, is to help scale-up capacity in countries, inform development policies and help prepare transformative development strategies that in the end will contribute to eradicate poverty, halt rising inequality, avert climate change and reverse the infringement of environment limits.